Detail from "Deffaite des Yroquois au Lac de Champlain," Champlain Voyages (1613). This self-portrait is the only surviving contemporary likeness of the explorer. Samuel de Champlain (French pronunciation: ​[samyɛl də ʃɑ̃plɛ̃]) (about August 13, 1567[Note 1][Note 2] – December 25, 1635) was a French colonist, navigator, cartographer, draftsman, soldier, explorer, geographer, ethnologist, diplomat, and chronicler. 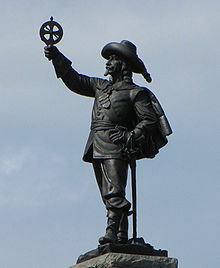 He made between 21 and 29 trips across the Atlantic Ocean, and founded New France and Quebec City, on July 3, 1608. 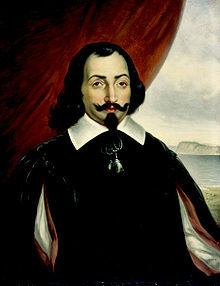 An important figure in Canadian history, Champlain created the first accurate coastal map during his explorations, and founded various colonial settlements. Born into a family of mariners, Champlain began exploring North America in 1603, under the guidance of his uncle, François Gravé Du Pont. 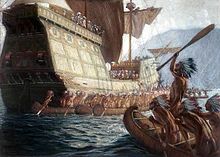 From 1604 to 1607, he participated in the exploration and settlement of the first permanent European settlement north of Florida, Port Royal, Acadia (1605), as well as the first European settlement that would become Saint John, New Brunswick (1604). In 1608, he established the French settlement that is now Quebec City, Canada. [Note 3] Champlain was the first European to describe the Great Lakes, and published maps of his journeys and accounts of what he learned from the natives and the French living among the Natives. He formed relationships with local Montagnais and Innu, and, later, with others farther west — tribes of the (Ottawa River, Lake Nipissing, and Georgian Bay), and with Algonquin and Wendat; he also agreed to provide assistance in the Beaver Wars against the Iroquois. In 1615, Champlain reunited with Étienne Brûlé, his capable interpreter, following separate four-year explorations. There, Brûlé reported North American explorations, including that he had been joined by another French interpreter named Grenolle with whom he had travelled along the north shore of la mer douce (the calm sea), now known as Lake Huron, to the great rapids of Sault Ste. Marie, where Lake Superior enters Lake Huron, some of which was recorded by Champlain. A garden called Jardin Samuel-de-Champlain in Paris, France. ^ "The Explorers Étienne Brûlé 1615-1621". Virtual Museum of New France. Canadian Museum of History. Retrieved 7 April 2019.